Authors Will Zeilinger and Janet Elizabeth Lynn, moderator Shannon Muir, and author Jill Amadio (l to r) are introduced by Denise Fiedler, Senior Librarian for the City of Torrance at Henderson Library. 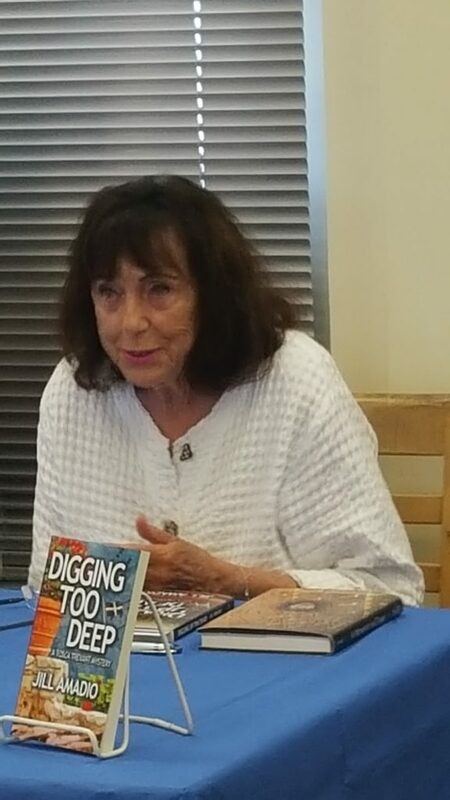 Tying in to the local summer library reading program “Reading Takes You Everywhere,” authors Will Zeilinger, Janet Elizabeth Lynn, and Jill Amadio spoke to attendees July 28, 2018, at the Henderson Library in Torrance about how “Mysteries Can Take You Everywhere”. They discussed how mysteries set in different modern-day locations than a reader knows, as well as in the past, or featuring characters who are not from the areas where they are solving mysteries, could bring the reader new experiences. Moderating the panel was Sisters in Crime Los Angeles board member Shannon Muir, who has authored short stories set in different places and times and drew on that to bring engaging questions to the event. Author Will Zeilinger introduces himself. Each author introduced themselves and then read a several minute excerpt from their work. Will Zeilinger spoke and read first. He talked he started as a graphic designer and started writing later in life, as well has having moved around with his family as a child and later catching the travel bug with his wife. He read from the latest book in the Skylar Drake mystery series, SLICK DEAL. Author Janet Lynn reads from SOUTH OF THE PIER. Janet Elizabeth Lynn (also Will’s wife and co-writer on the Skylar Drake mysteries) shared how her work in non-profits sent her around the world and how she drew on those locations in writing her PIER books. She then read an excerpt from her first of that series, SOUTH OF THE PIER. Author Jill Amadio explains how she brings her own background being from Cornwall in the U.K. to her works. Jill Amadio originally comes from Cornwall in the U.K. and uses this same background for Tosca, her lead character in the books DIGGING TOO DEEP and DIGGING UP THE DEAD. She read a passage from her latest book, DIGGING UP THE DEAD, that helped stress how her character is different from the Balboa Island locale she’s in, but yet at the same time not fully a “fish out of water”. This passage served as a jumping off point to the panel questions. Everyone’s character was somewhat “out of their element” in some way, whether originally from another area in modern day like Jill’s and Janet’s lead characters, or in the case of the Skylar Drake mysteries that Will and Janet co-write, though the lead character is in 1955 California there are several books with out of state cases in Las Vegas and pre-statehood Hawai’i. In Janet’s case, she drew heavily on her personal experience as being an American in the different lands and then her fascination with the cultural differences when writing the PIER books. The authors discuss how they use research and experience from their travels in writing their mystery stories. Next, the panel discussed research. Since Jill pulled a lot from her personal life and background in building the Tosca character – though not the story situations – Jill talked about the role of research in how it affected her plots. With the Skylar Drake mysteries being set in 1955, Will and Janet talked a lot about the role of history in making the stories authentic, including getting the chance to personally interview people from that time, and told several stories about people they got to talk to that completely entertained the audience. Two other panel questions that grew out of the research discussion involved how the authors plot their stories and how they develop on the types of characters and situations they write about. Jill and Will admitted they are more “pantser” approaches in their writing (writing to see where the story will take them), and Will also emphasized Janet tended to outline more. As far as character development, all the authors mentioned that research definitely played a role in the kinds of characters they chose to write about. Will and Janet also talked about how writing the Skylar Drake mysteries together helped better craft the overall story, as she likes writing in the time period, while Will focuses more on making sure Skylar feels authentic as a man in that time period. Authors answer questions from the audience. The next question asked the panelists what they enjoyed most about telling the kind of stories they write. After that, the last open panel question, tying in with the reading program, involved the authors letting the audience know what they look for in books they read that are set in other places and times, or other authors they recommend. After that, a couple of questions were then asked from the audience and answered by the panel. Attendees buy books and get them signed by the authors. The day closed with the attendees getting to spend some one-on-one time with authors and being able to have books purchased and signed. If you know of a library, book club, or organization interested in bringing an experience like this to your group in the Los Angeles area, please have them contact the Speakers Bureau of Sisters in Crime Los Angeles at SinCLAspeakersbureau@gmail.com. The Speakers Bureau of Sisters in Crime Los Angeles is a benefit for members of the organization that helps match authors with speaking opportunities at libraries and other community events. If you are a current member in both Sisters in Crime National, as well as Sisters in Crime Los Angeles, find out more on the Speakers Bureau page of the website.